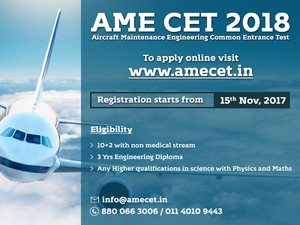 Yes, Aircraft Maintenance Engineering (AME) is good field to make your career in aviation. The awareness of Aircraft Maintenance Engineering (AME) is less in India that’s why there is no crowd in this field and the scope is also good in India as well as Foreign airlines. The study of Aircraft Maintenance Engineering is technical and practical so, you are interested in the study of aircraft than you must join this course. Aircraft Maintenance Engineering is three year license program and is regulated by Directorate General of Civil Aviation (DGCA), Govt. of India. AME is also authorized to issue the Flight Releasing Certificate. It is very responsible and respectful job in aviation.